Kenya is a country in East Africa with a population of just over 43 million people. Kenya is a popular tourist destination for seeing wildlife such as ‘The Big 5’ and with 224,610 square miles savannahs and tropical and subtropical rainforests its clear to see why Kenya is so abundant in wildlife. The African Elephant is classed as Vulnerable by the IUCN Red List. There is evidence that the African Elephant should be split into two separate species: The Savannah Elephant (Loxodonta africana) and the Forest Elephant (Loxodonta cyclotis). The African Elephant is the largest terrestrial (land) animal, and luckily for them their numbers are on the rise. They can be found roaming in dense forests, open and closed savannahs, grassland and occasionally in arid deserts. The African Elephants do have some major threats to their survival. Historically the main threat came in the form of illegal hunting (poaching) for ivory and meat. However, recently the most current threat is the loss and fragmentation of habitat. 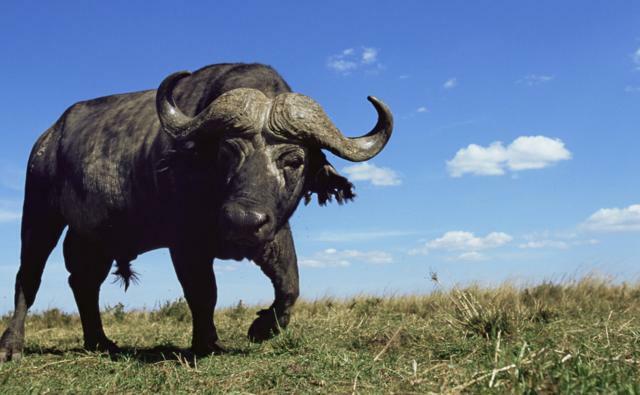 The African Buffalo is classified as Least Concern by the IUCN Red List. Its believed that there is around three of four different subspecies of African Buffalo: The Forest Buffalo (S.c nanus), the West African Savannah Buffalo (S.c brachyceros), the Central African Savannah Buffalo (S.c aequinoctialis) and the Southern Savannah Buffalo (S.c caffer). Unfortunately for the African Buffalo their numbers are on the decline. They are distributed throughout sub-Saharan African and can be found in semi-arid bushland, Acacia woodland, montane grasslands and forests, coastal savannahs and moist lowland rainforests. African Buffalo have faced several major threats to their survival. In the 1890s the rinderpest epidemic, coupled with pleuro-pneumonia, caused mortality rates as high as 95%. Since the 1890s diseases such as rinderpest and anthrax have continued to result in localised declines and extinctions in populations. The African Buffalo is also subject to habitat loss and drought. They are also a favourite target of meat hunters and so have high rates of illegal hunting. The Cheetah is listed as Vulnerable by the IUCN Red List and their numbers are currently in decline with only 6674 mature individuals left in the wild. Cheetahs are the only cat that has non-retractile claws and are the fastest land mammal. They can be found in the dry forest and thick scrub, grasslands and also in hyperarid deserts. The Cheetah is facing some major threats to their survival. Habitat loss and fragmentation is causing big problems for the cheetahs, as well as high speed roads and human-cheetah conflict. Cheetahs rarely hunt livestock but in desperate times they will choose livestock as their prey, this results in retaliation kills from the farmers. The Leopard is classified as Vulnerable by the IUCN Red List and they currently have a decreasing population trend. Leopards can be found in desert and semi desert regions, arid regions, rugged montane and savannah grasslands. Leopards are currently facing major threats from habitat fragmentation, reduced prey bases and from conflicts with livestock. The African Lion is listed as Vulnerable by the IUCN Red List and again they currently have a declining population trend, with around 23000-39000 mature individuals in the wild. African Lions are only absent from the tropical rainforests and the interior of the Sahara desert. Lions are the most social of the cats with related females remaining together in prides. African Lions are facing major threats from indiscriminate killings, prey base depletion and habitat loss and conversion. The Black Rhino is classified as Critically Endangered by the IUCN Red List but luckily their current population is increasing. 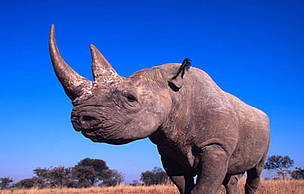 Black Rhinos can be found everywhere from desert areas to wetter forested areas. The highest densities of black rhino are found in savannahs and in succulent valleys. Black Rhinos are facing a major threat from poaching for the international rhino horn trade, and also from habitat changes, competing species and alien plant invasions. 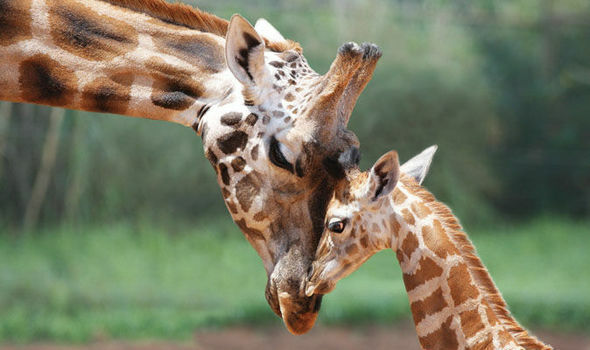 The Giraffe is currently listed as Vulnerable by the IUCN Red List and unfortunately the current population numbers are decreasing with around 68293 mature individuals remaining in the wild. The IUCN Red List lists the Hippopotamus as Vulnerable and their current population numbers are stable. The hippo spends its days in the water and emerges at night to feed. Hippos require a permanent source of water as their skin needs to remain moist so that it doesn’t crack. They also secrete a red liquid that is believed to function as a sunblock and an antibiotic. The major threats that are affecting the survival of the hippo come from habitat loss and the illegal and unregulated hunting of hippos for their meat and ivory.